When I arrive at a race, the work is already done and it all comes down to executing mentally on race day. I arrived in Yokohama fairly early. Usually I arrive three days prior to the event, but because of the 10 hour travel day, I arrived five days prior to the race. Japan is one of my favorite places to race and visit (one reason being the food: sushi, sweet potatoes, and bubble tea). On race day, as I walked my bike to transition, I went through my mental checklist. ASICS racing flats? √ Specialized Amira? √ SRM? √ Helmet? √ Oakley sunglasses? √. I racked my bike and checked my tires to make sure there was no debris or dirt or glass that could cause a potential flat. After that I checked the tire pressure. As I rotated the wheels, I checked the brakes to make sure they weren’t rubbing. Once everything looked good, I checked once more that I had everything I needed (at a previous race, I once almost forgot my ASICS and as I double checked everything, I realized in panic that I forgot my shoes!). The swim was unique as it was a non wetsuit swim in choppy water. There was a strong current coming from the left that hit the shore and then pushed the water back to the right (making it appear like the current was pushing athletes from right to left). However, once I dove in, I felt a current from my left. It was extremely choppy, making it difficult to move up and break away on the swim. This caused a massive pack to exit the water together. Once on the bike, a pack of 42 formed. When there is a big group, it is often hard to get everyone motivated to work. Yokohoma was a selection race for many nations, which also can create a slower bike. I was hoping for a hard bike--and my bike split was minutes faster than last year--but it still didn’t feel as difficult or fast as I would have anticipated. I got off the bike and ran my own race. I am known to negative split (get faster as the race goes on). This time, I got off the bike and my legs felt fresh, so I ran my own pace and before I knew it, I had a lead. I tried to maintain pace, but began to slow on the last lap. Crossing the finish line in first was amazing. It was my fourth time winning in Yokohama. The fans were incredible in Yokohama. I don’t think there was any part of the run course that wasn’t lined with spectators. Thank you to all the volunteers and fans who made the race safe and fun. I am now in Vitoria (Basque Region), where I will remain until the Rio Olympics. I couldn’t ask for better training grounds or training partners. The riding is beautiful and safe. Salburua, which is a trail less than one minute from my doorstep, is my favorite place in the world to run, and there are multiple world class pools to train at. My next race will be in Leeds, United Kingdom, which is a new stop on the WTS circuit sponsored by Columbia Threadneedle. Thank you to everyone for your support, help, and cheers. 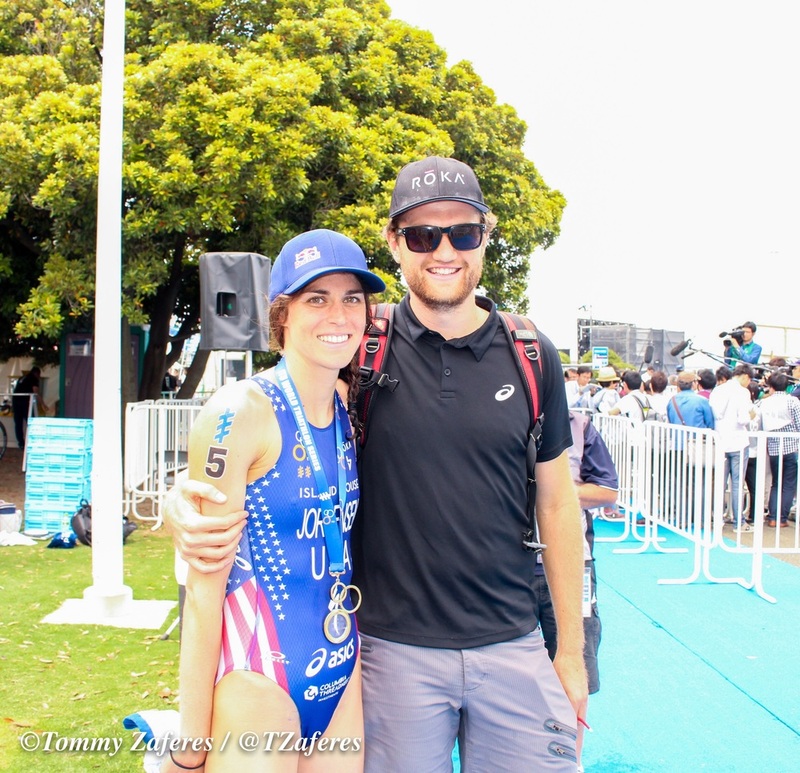 I had so much fun racing in Yokohama, which wouldn’t have been possible without my enormous support crew. A special thank you to Jamie, Patrick, and the Wollongong Wizards. I’m looking forward to the upcoming work as we head towards August 20th. Pre race swim with the Gong Wizards. Photo thanks to Tommy Zaferes. Thank you fans for pushing us athletes to do our best. Photo thanks to Tommy Zaferes. Charlotte is one of my training partners who works so incredibly hard! Proud of her highest ever WTS finish! Patrick and me post race :) Photo thanks to Tommy Zaferes. Photo thanks to Delly Carr. I've signed something for Naomi for three years now, she's so kind and generous. Thanks for being a fan! The streak. I can’t remember the last interview I did when I wasn’t asked about the streak. To be honest, I never knew what to say because the truth is I didn’t think about it. I always just looked forward to the next race and tried to execute on the day, which is what I did in Gold Coast. Gold Coast was my first WTS of 2016. 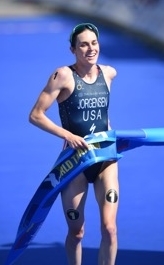 I don’t have a great track record of coming out strong in my first WTS of the year (I missed the front pack swim in Abu Dhabi in 2015; I was 12th in Auckland in 2014; I had a DNF in Auckland in 2013; I was 4th in Sydney in 2012 – this was an outstanding race at the time for me and also the first time I did a training stint with Jamie Turner – ; and I had a DNF in Madrid in 2011). I came into Gold Coast with confidence. I believed I had the ability to win, but I also knew that my competitors did too. The Gold Coast race started and I was happy with my swim. The swim was extremely rough and I got pulled back and under water many times, but I was able to stay in contention with the front pack. We started the bike and I was under pressure. I fought hard, but when Flora Duffy, Helen Jenkins, and Andrea Hewitt attacked, I wasn’t able to match them. The bike course changed from 2015, making a huge difference. There were numerous power spikes on the bike course and it was technical with few straights to recover on. The three strongest riders were able to stay away on the tough bike course and come into transition with over a 90 second lead. My engine was there, but my tank felt like it was filled with diesel instead of high octane. The streak was fun while it lasted, but it is now over. I appreciate the concerns and notes asking if I am okay. To be honest, I am doing great mentally and physically. Obviously every race I start I want to win. But so do my competitors. I gave it my all in Gold Coast and came across in 2nd place. In 2013, when I was third at Cape Town, I debated quitting the sport. I have no thoughts of quitting this time around. Maybe I have matured, maybe I love the sport too much, maybe I’m just excited to keep trying to improve, or maybe I realized the outcome isn't always the end. I can tell you one thing for sure: I’m motivated and excited to continue trying to improve. I am now back in Wollongong for three weeks of training before heading to the Yokohama WTS. Thank you for all the support. Photo thanks to Korupt Vision. This was the bike preview. This was at the swim preview. Photo thanks to Tommy Zaferes. Photo thanks to Tommy Zaferes. Podium shot thanks to Delly Carr. The hotel restaurant, Shima, served the best curry I’ve ever had. We were treated to endless sashimi, appetizers, pork, salads, desserts, and wine. I didn’t want to leave; however, after a few days, it was time to take a 90-minute ferry to Highbourne Cay. Highbourne Cay is a small island about four km long. Our cottage offered front row seats to the beach and ocean. There are no cars on Highbourne Cay; instead, you get around by driving golf carts. Typically on Highbourne Cay, you would drive on the left side of the road, but because we (the athletes, camera crews, etc.) were the only ones on the island, we drove on right side of the road because we were going to be riding in that direction for the race. It’s nice to be in a place so remote that we could change the side of the road we drove on. It was just one of many perks on Highbourne Cay. The race was a three-day event starting on Friday, November 6th. The first event was the prologue: 300m swim, 7km bike, and 2km run. We were sent off one at a time, one minute apart. In order to determine the order, we drew our start position. I somehow picked #1, so I got to go last in the prologue. I stood on the beach and watched my competitors go off one at a time and soon it was my turn. I ran in the ocean and swam as fast as I could. The 300m swim was over before I knew it and I hopped on my bike for a technical, hilly course. I underestimated the undulation on the island and it definitely took a toll on my body. I entered transition and had no idea if I was ahead or behind the others in front of me. Every second counted because our times from each day were added together for a final time that determined the winner. I pushed as hard as I could on the run, but I was going slowly because we were running on soft sand. When I crossed the finish line, Patrick told me I won. I laughed at him and said “Funny joke, honey.” Considering the format (non-draft, time trial event that is not my specialty) I never, ever imagined that I could win the prologue, but somehow I won the stage and surprised even myself. The second day was an Olympic distance draft legal triathlon--something I love! However, it wasn’t a normal triathlon. This stage consisted of 3x(500m swim, 13km bike, 3.3km run). All the women started the swim together and I was in the lead pack of about five going into the first transition. We mounted our bikes and immediately had to ride up a hill. It was so hard that I had to start in my 39-19 and I still struggled to make it up. The bike was 3 laps per 13km and at the end of each lap, we had to do a u-turn right into the hill. I got off the bike in the front pack with Flora Duffy and Lisa Norden (who suffered a flat tire) right behind. We began the 3km run and it was by far the hardest run I’ve ever done in a race. There were multiple, steep hills per lap. By the end of the run on the first round, I was ready to run back into the ocean to cool off. I stayed with Flora and Lisa for most of the race and ended up pulling away from them on the last leg of the run. That evening my body was a wreck. Patrick suggested I go out for an easy spin, so I went out for a bike ride and noticed all my competitors had the same idea. I rode for 30 minutes and Patrick had to literally push me up the hills. I woke up on the third day and I could barely walk to the bathroom because I was so sore. I’ve never done a stage race before and I have so much respect for Tour riders after realizing the toll a multiple day race takes on your body. I kept telling myself that if I was tired, everyone else must be tired too. We started the third stage one at a time (not a mass start). I went off first, and the other ladies went off behind me at their deficits (so the first person across the line would be crowned the overall winner). This final race was a non-draft sprint distance triathlon. The bike was straight forward, and on the same course as the other two days. The run was completely different than the previous two days and we ran on the beach, sand, and the pavement. Lisa caught me on the bike and we started the run together, but I was able to pull away and come across the finish line in first. With the depth of the competition (in the various styles of triathlon) I didn't know what to expect and was shocked to place first, but I couldn’t have been happier to finish first in the inaugural Island House Triathlon. The event was my favorite of the year. Mark Holowekso brought in ITU athletes, non-draft athletes, Kona superstars, and Xterra athletes. Being able to hang out with and get to know the non-draft athletes was a highlight. They are some amazing individuals. A special shout out to my roomies for the many laughs and good times: Javier Gomez, Anneke Jenkins, Tim Don, Cam Dye, and, of course, Patrick. There were a few things that got me through the weekend when I was so tired I could barely walk: the food and drinks provided by Xuma and Shima, the people, the weather, and the beautiful views. If you ever get a chance to go on a vacation, I highly recommend The Bahamas. I need to give a huge shout out to Luke McKenzie and Beth Gerdes, the race directors. For a first time event, I was so impressed with the professionalism of the race. Luke would set up the course at 5am, hand out water during the women’s 8am race and then he would race himself one hour later. To say he was impressive is an understatement. Every athlete appreciated what he did to make the event a success. The race will be shown nationwide on TV, but the timeslots vary depending on where you live. This was the final stage. Although I was the first across the line, Lisa was the one who won this individual stage. Photo thanks to Nils Nilsen. Flora Duffy and me during Stage Two. Photo thanks to Nils Nilsen. Flora and me dismounting our bikes. Running in the sand. Photo thanks to Nils Nilsen. Photo thanks to Nils Nilsen. From left to right: Javier, Anneke, Patrick, Me, Tim, Cam. I had so much fun with this group! Patrick grabbed this photo of me pre-race. Anneke took this photo during Stage Three of the race. Going for a spin after the Second Stage.